The 39 metre motor yacht Me Gusta, listed for sale by Marcos Morjain at Reel Deal Yachts, has had a €50,000 price reduction. Built in GRP by Italian yard Overmarine, Me Gusta was delivered in 2007 as a Mangusta 130 model and benefits from a recent major refit. Accommodation is for up to nine guests in four cabins consisting of a full-beam master suite, VIP suite and two doubles, all with entertainment centres, flatscreen televisions and en-suite bathroom facilities. A further three cabins sleep five crewmembers aboard this yacht for sale. The main deck features an elegant, spacious saloon and dining area with large windows offering panoramic views. There is a bar to port and comfortable couches with coffee tables to starboard. An access stairway situated to port forward of the bar leads to the crew quarters and galley. There is also a full wet bar and a home theatre system positioned in the furniture separating the living area and dining area, rising on a lift mechanism. Outside, a special feature is the aft deck, offering al fresco entertaining and a Jacuzzi. This deck gives access to the flybridge area with outdoor dining in the aft area, an electric barbecue, wet bar with icemaker and a mini fridge. To starboard are seating and sunning areas, all protected by a Bimini top. Twin 3,650hp MTU diesel engines linked to KaMeWa water jets push her to a top speed of 31 knots. 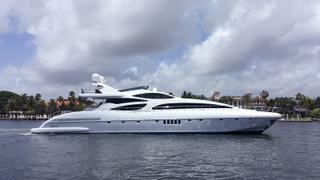 Lying in Miami Beach, Florida, Me Gusta is now asking €4,945,000 with US duty paid.